I See Me! I’m a Big Boy Now! Personalized Book Review! I just adore the personalized children’s books and gifts from ISeeMe.com! Last year I reviewed their 1-2-3 Blast Off With Me Personalized Book and I purchased several books and coloring books to give as gifts this last Christmas. The personalized and unique gifts were a huge hit and the kids loved them. My sisters and brother really loved them and thanked me graciously for such a wonderful gift that would be a keepsake! I love giving gifts that everyone loves! This adorable personalized storybook praises your little boy for becoming a “Big Boy” and doing “Big Boy” things, such as going on the potty, sleeping in a “big boy” bed, getting himself dressed, saying “please” and “thank you”, brushing his teeth, trying new foods at dinner time, and more. The book increases self-esteem by encouraging young boys that they CAN DO IT…. and it emphasizes how great he’ll will feel when he learns to do “big boy” things. When ordering, you can select your child’s hair and skin color, so the character in I’m a Big Boy Now!resembles him. He’ll love seeing his name on the cover and throughout the text and illustrations. You can even personalize the dedication page with his photo! Written by award-winning author Jennifer Dewing and illustrated by Holli Conger, this 8.5”x 8.5”, 20 page hardcover book is sure to become a favorite for boys 2-5 years old. My 4 year old son just loves the “I’m a Big Boy Now!” book! He can relate to everything in the book. He was commenting on every page, “I can do that!” This book is one of his favorites to read and we have read it almost every night since we received it. “I’m a Big Boy Now!” book really makes him feel confident and proud of himself for being a Big Boy! Also, it encourages your child to practice good habits like brushing their teeth, going potty, dressing themselves and so on. My son thanks UNDERPANTS is about the funniest word in the world! He cracks up at this page every time! The illustrations are adorable and like all personalized I See Me! 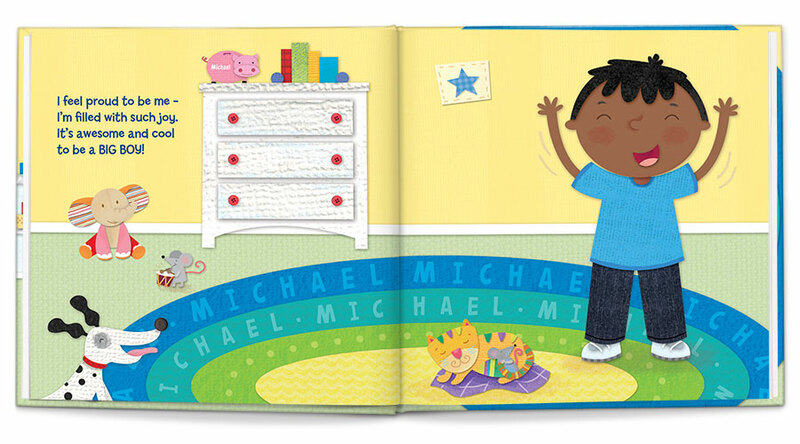 books your child’s name is worked in to the pictures on almost every page. You can see a name on the piggy bank in this picture. My son loves to find his name throughout this book! I See Me! books have won many awards, including Mom’s Choice, Creative Child, Family Choice, Oppenhiem, iParenting, Homeschool.com and more. They have been featured in The Wall Street Journal, Today Show, Babycenter.com, Pregnancy & Newborn Magazine & more! I See Me! offers the perfect personalized gift that are unique and great for any occasion! Also, I See Me! offers more then just books! They have personalized Lunchboxes / Puzzles /Coloring Books/ Placemats / Stickers and Growth Charts! Something for everyone and every occasion! See What’s Cool for Back to School! Offer expires 8/31. Summer Reading Sweepstakes!! Grand prize gets a $250 Visa Gift Card and 5 Personalized Books!! 25 Runners Up get a personalized coloring book. Ends 8/31. You can purchase I See Me! products on their website! Sign up for Email promos/discounts and updates Here. FREE SHIPPING (standard, US Continental) on orders $75 or more. No coupon code needed.